Have you ever been digging through the bins with a vague intention of finding works by one artist and picked up something similar, but not quite what you were looking for? I discovered Gary McFarland records accidentally, digging through the bins looking for Gerry Mulligan records. It’s understandable due to their close alphabetical proximity there in the “M’s” and they kind of look alike if you don’t really pay attention. Their sounds are pretty different though. McFarland sounded a little to “pop” for my young, at the time, jazz ears and after a few records I kind of lost interest in him. Writer-director-producer Kristian St. Clair’s documentary This is Gary McFarland distributed by Light In The Attic Records is the kind of treat that changes your tastes in music. I get it now. McFarland is one of those artists whose personal history is a big part of their sound. Get this DVD/CD combo and get hip to one of the ‘60s hippest. See the DVD, get hip to McFarland, and then I’ll see you digging in the bins. In the “M’s”. I figure I have about a week head start on you. My daughter went to the House of Blues last night. (To see a band I’ve never heard of, of course). This morning she was going on about how awesome they were/it was. I was tempted to try to find out who the band was, and pick them apart. Because I can. Instead I ventured, “Isn’t live music the best?” To which she responded, “Oh my god, yes. I wish I never had to listen to my ear buds again.” Nice answer. And, nice Dad move, if I do say so myself. Against William Buffet’s best financial advice, instead of buying stock index funds I went out and purchased the Beatles Mono Box set. My thinking was I could sell all my lesser sounding Beatles records to pay for the new Mono Box set, which to my ears, compared to my Beatles records, is the best recording yet. My first Fest was fantastic. Wayne and Gary Johnson from Rockaway Records blessed us with the Ed Sullivan Wall the Beatles signed in 1964 (starting bids $550,000) and probably another $500,000 in ultra rare Beatle Records and memorabilia — some of which I owned and destroyed playing with as a 10-year-old in 1966. My favorite story from The Fest For Beatle Fans starts with a second stage (unpeeled) Butcher cover. Except you couldn’t see the Butcher cover through the trunk cover pasted over it. What I am saying is, you know how you can see the triangle of Ringo’s black sweater through the pasted over trunk cover? (You do now.) This record you couldn’t. 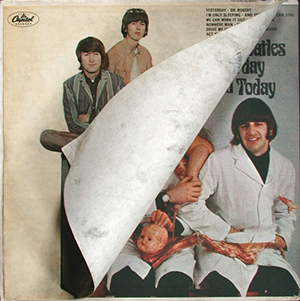 A large corner of this cover had completely bent, exposing the Butcher cover underneath. The cover was pasted a little high. But you would be really lucky if you notice that Butcher cover underneath this trunk cover. I was standing with serious Beatle experts, Bob Say from FreakBeat Records, Beatle historian and author Bruce Spizer, Wayne and Gary Johnson from Rockaway and Jim Henson from Blue Jay Way in Texas. It was spooky to see the looks on their faces when they realized the possibility of all the second stage covers that might have been missed.